Lord Byron was the greatest romantic poet of all time. 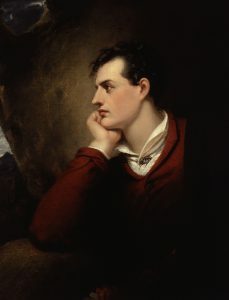 Born George Byron on 22nd January 1788, he became Lord Byron, the sixth Baron Byron, at the age of ten in 1798 when he inher­ited the title from his great uncle, William Byron of Newstead Abbey. He was a com­plex char­ac­ter who led an uncon­ven­tional life­style, but his writ­ings live on forever and pos­sibly more has been writ­ten about Byron than even Jesus Christ. Byron atten­ded Harrow School and later, from 1805 until 1808, Trinity College Cambridge where developed a love of sport — cricket, boxing, shoot­ing, horse riding and swim­ming — des­pite having been born with a club foot. Boxing was a par­tic­u­lar pas­sion. At Trinity dogs were banned as pets but he man­aged to work round petty rules by having a brown bear. During this time he engaged in many sexual adven­tures and fell deep into debt through gambling. After uni­ver­sity he embarked on a grand tour through the Mediterranean and the Aegean seas. Upon turn­ing 21, he took his seat in the House of Lords but only made three speeches, mainly in sup­port of the Luddites who were cam­paign­ing against the intro­duc­tion of machinery which would result in put­ting people out of work. Byron through­out his life cham­pioned the under­dog. His first volume of poetry, ‘Hours of Idleness’ in 1808, was attacked by the lit­er­ary estab­lish­ment in Edinburgh but Byron retali­ated with the satir­ical poem ‘English Bards and Scottish Reviewers’ which attacked the elite with wit and satire. This gained him his first lit­er­ary recog­ni­tion. In September 1814, Byron pro­posed to Annabella Milbanke and they mar­ried in January 1815, having a daugh­ter born in the December. However, the mar­riage was short-lived, fin­ish­ing in the January amid his drink­ing, gambling and affairs. The daugh­ter was Ada Lovelace, who worked with Charles Babbage the com­puter pion­eer and she was attrib­uted as being the first com­puter pro­gram­mer. Byron’s life of debauch­ery and lust con­tin­ued but he man­aged to pen his greatest poem ‘Don Juan’ which was a change from the mel­an­choly ‘Childe Harold.’ In 1823 he accep­ted an invit­a­tion to sup­port the fight for Greek inde­pend­ence from the Turks, selling Newstead Abbey and sink­ing all his sav­ings into the cause. On 15th February 1824 he fell ill and died at the age of 36. He became a Greek hero and to this day his name and memory are cel­eb­rated in parts of Greece. He was mourned in England and buried in the family vault at Hucknall Church, Nottinghamshire. Clearly a remark­able, tal­en­ted and com­plex man, his poems and his memory are still revered 200 years on and he is regarded as one of the greatest British poets. He is best known for his bril­liant use of the English lan­guage and also his promis­cu­ous life­style.